Bollywood celebrity trainer Prashant Sawant has been credited for the unbelievably toned abs of some of the biggest A-listers in the industry. From Shah Rukh Khan to Varun Dhawan, Ajay Devgn, Karthik Aryan, and more recently, Salman Khan’s brother-in-law Aayush Sharma, Sawant has taken credit for sculpting some of the fittest bodies in the industry. Sawant has quite a presence on social media as well and on Instagram he boasts of almost 70 thousand followers. Sawant keeps sharing incredibly inspiring workout videos of himself as well as his notable clients on Instagram, encouraging his followers to achieve their body goals. But apart from sharing fitness and workout inspiration and advice, Prashant Sawant is also often seen sharing diet advice. Sawant is a firm believer of a healthy diet, which he believes is as important as workouts and exercise. A lot of Prashant’s Instagram posts are about the value of consuming the right kind of meals, which compliment your workouts, and how devastating eating the wrong food can be, to the progress you have made in the gym. 1. Best Foods For Muscle Gain: According to Sawant, you can look like your favourite Bollywood celebrity in as little time period as just eight weeks! 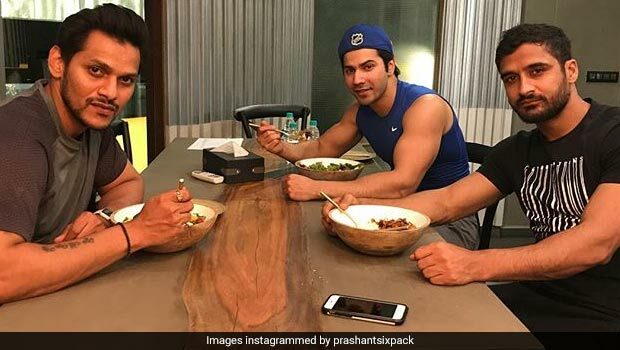 In an Instagram post, he talked about the best foods for muscle gain, which include eggs, cottage cheese or paneer, chicken and tuna, as well as whole grain cereals and fruits and vegetables. While eggs, cheese, chicken and tuna are all rich in protein, whole grains and fruits and veggies are important to provide your body with fibre for gut health and good carbs for muscle repair and an energy boost. 2. Bottle Gourd Juice For Weight Loss: Prashant Sawant recommends adding bottle gourd juice to your breakfast, in order to lose pounds quickly. Bottle gourd juice is one of the best fat burning juices. This is because of the high-fibre content of this low-calorie veggie. It also contains zero fat and essential minerals and vitamins like C, B, K, A, E, iron, folate, potassium and manganese. 3. Almonds For A Healthy Snack: Nuts are considered to be one of the healthiest snacks out there, especially if you’re looking to lose weight fast. Prashant Sawant recommends snacking on some almonds to stave off hunger pangs. “When hunger pangs tempt you to reach out for a quick bite, choose almonds! Almonds are among the richest sources of health-benefiting nutrients and will curb your hunger. Keep some close for the perfect after-work out snack”, Sawant said on Instagram. He also warned against slipping up and eating a calorie-dense dessert for snack, as it may negate your workouts. 4. Cocoa Extract For Fat Burn: Prashant Sawant advises adding two tablespoons of cocoa extract to your pre-workout protein shake. This is because cocoa is rich antioxidants and has been known to be a fat burner and something that boosts physical performance in athletes. A 2016 study published in the Journal of Sports Nutrition concluded that eating a little dark chocolate every day before cycling, significantly improved oxygen uptake by the body’s cells, improving their performance. So the next time you feel like munching on some chocolate, do so right before your workout, or simply add some cocoa extract to your protein shake, like Sawant suggests. However, mind those calories by making sure your chocolate brand contains more cocoa and less sugar. 5. Soy Milk Over Regular Milk: Milk from cows and buffaloes normally rules the roost in the Indian diet, as it’s often referred to as ‘a complete milk’. However, Prashant Sawant recommends switching your regular dairy milk with soy milk, owing to its rich nutrient profile and benefits for people who wish to lose weight and gain lean body mass. Tofu or soy is very rich in protein and a lot of fitness experts recommend consumption of chocolate soy milk after workouts for quicker muscle repair. 6. Cinnamon For Weight Loss: Dalchini or cinnamon has been long known for its weight loss benefits and it seems like even Prashant is on board with the benefits of this magical spice. Cinnamon not only helps in burning fat and effecting weight loss, but also in controlling blood sugar levels and regulating levels of insulin hormone. So there you have it! If you were having difficulty finding the motivation to kick-start your body transformation journey till now, we’re sure that after reading these tips and going through Prashant Sawant’s profile, you’ll be compelled to get on that treadmill and start eating healthy from right this moment! Why should you choose the best fertility hospital in your city?